Jewish graves in New Zealand were painted with Nazi slogans in attack condemned as "vile desecration." Vandals defaced Jewish gravestones in central Auckland with graffiti including Nazi swastikas, the AFP news agency reports, in a crime the Israeli embassy condemned as "vile desecration". About 20 graves, some dating back to the 1880s, were spray-painted in the Jewish section of the Karangahape Road Cemetery, the New Zealand Herald reported. 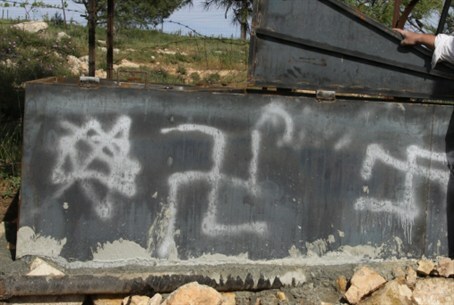 Photographs showed rows of graves sprayed with swastikas, the number "88" -- a code used by neo-Nazis to mean "Heil Hitler" with H being the eighth letter of the alphabet -- and anti-Semitic messages. The Israeli embassy in Wellington urged New Zealand authorities to bring the vandals to justice. "Sixty seven years after the liberation of the Jewish people from the death camps and ghettoes of Europe, expressions of blind hatred for Jews and for the sole Jewish state resurface," it said in a statement. "This is clearly the action of a handful of vandals, motivated by hatred and ignorance, who certainly do not represent the opinion of New Zealanders." New Zealand Jewish Council president Stephen Goodman said it was the first anti-Semitic vandalism at the cemetery. "It is incredibly disappointing to think that this sort of thing happens in New Zealand," he told NZ Newswire. "New Zealand is normally quite a tolerant society and quite accepting, and the Jewish presence has been in New Zealand for over 170 years." Police said they were investigating and appealed for witnesses.